This is fact! There are more than 9,000 talcum-powder lawsuits across the country. The lawsuits name as defendants companies like Johnson & Johnson and even the companies that mine talc and supply it to the manufacturers. While only a few lawsuits have gone to trial, so far Johnson & Johnson has lost most of them. In St. Louis, Missouri Johnson & Johnson has been ordered to pay $4.14 billion in punitive damages and $550 million in compensatory damages to 22 women and their families who say asbestos found in the company’s talcum-containing baby powder contributed to their ovarian cancer. In May of this year a Los Angeles jury delivered a $25.7 million verdict against Johnson & Johnson in a lawsuit brought by a woman who claimed she developed cancer by using the company’s talc-based baby powder. The plaintiff in that suit suffers from mesothelioma, a lung cancer linked to asbestos exposure. Most of the lawsuits were brought by women who sprinkled baby powder on their inner thighs to prevent chafing, or use it on their perineum, sanitary pads or underwear for its drying and freshening effects. Their claim is that the crystals in the talc were absorbed into their bodies and caused cancer. Johnson & Johnson says its signature powder has always been safe and asbestos-free. Numerous studies have linked genital talc use to ovarian cancer, but the research findings have not been consistent. Experts hired by the plaintiffs have testified that talc might lead to cancer because the crystals can move up into the peritoneal cavity, where the ovaries are, and may trigger inflammation, which is believed to play an important role in the development of ovarian cancer. Talc itself is mined in proximity to asbestos, and the Food and Drug Administration asks manufacturers to take steps to avoid contamination with asbestos. However, in October of 2017 a Los Angeles Superior Court judge threw out a $417 million verdict against Johnson & Johnson in a case filed by a woman who developed ovarian cancer after using Johnson’s Baby Powder on her perineum for decades. Many of the talcum powder plaintiffs point to studies from the 1970s linking talc to cancer, when scientists in Wales discovered particles of talc embedded in ovarian and cervical tumors. 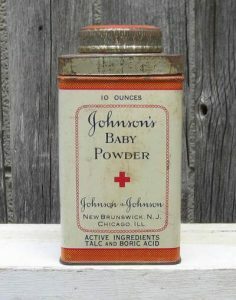 Johnson & Johnson still makes a variety of baby powder with talc, although most baby powder is now made with cornstarch. The U.S. Food and Drug Administration (FDA) has no official position on talcum powder safety. The European Union (EU) has banned talc in all cosmetics due to health and safety concerns. Cancer Research UK’s position is that there is no proven correlation between talcum powder and cancer. What do you think? Did Johnson & Johnson hide the risk of talc causing cancer? Or is it a mistake for juries to award these big verdicts when the scientific studies don’t reach the same conclusion?